The Washington area, like every other urban area, became embroiled in controversy once Interstate construction began after enactment of the Federal-Aid Highway Act of 1956. In some ways, the D.C. freeway battles were similar to those elsewhere. Advocates insisted that every freeway in the plan was essential to safety, economic opportunity, and congestion relief. Critics cited social, economic, and environmental impacts, especially on housing and communities for minorities, while urging officials to use the funds to build the freeway in a tunnel or transfer it to transit, housing, schools, playgrounds, crime fighting, or anything except freeways. Highway officials adjusted plans in response to the criticism, often suggesting the freeways could be built in tunnels or air rights could be used for housing or parks, but the changes did not deter the critics. As Secretary of Transportation Alan S. Boyd put it in September 1967, "Washington's transportation problems are-in one form or another-a microcosm of our Nation's transportation problems." A microcosm, yes, but the District of Columbia was different in one key way from those other urban areas. Under the Constitution, the city was a creature of Congress, which was the legislative body for city laws and controlled the purse strings with a tight fist. The city had been governed since the 19th century by three presidentially appointed commissioners until 1967 when President Lyndon B. Johnson established a presidentially appointed Mayor-City Council form of government that had power as long as Congress agreed with proposed actions. Other Federal agencies, such as the National Capital Planning Commission, had power over local decisions that no other city faced. By the late-1960s, the city was at an impasse. In February 1968, the U.S. Court of Appeals blocked several freeway projects, including the Three Sisters Bridge (I-266) across the Potomac River between the District and Virginia, because the city had not developed them in compliance with an 1893 city law covering development of highways in the District. And then there was Representative William H. Natcher (D-Ky.), chairman of the District appropriations subcommittee of the Committee on Appropriations. Very little could happen with District funds unless he agreed to appropriate them (something no other city had to face) – and he believed in a balanced transportation system that included all the planned Interstate freeways, the Metro rail rapid transit system, and bus service. He refused to appropriate District funds to match Federal funds for Metro until the city began building the blocked freeways. His action delayed the start of construction on the initial 25-mile Metro network that Congress had approved while authorized Federal funds for construction subject to the District match. Congress tried to override the court ruling in Section 23 of the Federal-Aid Highway Act of 1968, which directed the city and the U.S. Department of Transportation to build the freeways covered by the 1968 Interstate Cost Estimate, notwithstanding any other provision of law, court decision, or administrative action to the contrary. President Johnson nearly vetoed the Act because of Section 23, but thought its impacts could be reduced because the provision required the freeways to be developed in accordance with Title 23, United States Code. In his signing statement, he said, "If the authority of the executive branch were not so preserved, I would have no choice but to veto this bill as an infringement of basic principles of good government and executive responsibility." The City Council opposed Section 23 and the freeways that were not yet under construction – and especially the Three Sisters Bridge, which had become symbolic of the controversy. The council's views reflected the opposition of anti-freeway groups that said they did not want one more inch of freeways built. The impasse had delayed the start of Metro construction for a year by the time President Richard M. Nixon took office on January 20, 1969. Massachusetts Governor John A. Volpe (1961-1963, 1965-1969) resigned to become Secretary of Transportation. He had been the successful head of the Volpe Construction Company, a general contractor that, by coincidence, built the Department of Transportation's original headquarters at 400 Seventh Street, SW. He had served as Commissioner of Public Works in Massachusetts (1953-1956) and had been the first Federal Highway Administrator after Federal law created that position, serving from October 1956 to February 1957. While serving as Administrator, Volpe had been involved in meetings about the disputes about the Washington area's freeway network. Returning to Washington in 1969, Secretary Volpe said he was surprised to see that many of the freeways he had discussed with local officials in the mid-1950s were still on the drawing board. He promised to do something about it. When negotiations with the city, the House Public Works Committee, and Chairman Natcher failed to break the freeway-subway logjam, Secretary Volpe settled on a strategy of creating a bandwagon effect that would pressure Natcher to release the funds. As the first public step, Secretary Volpe convinced President Nixon to take a helicopter tour of the District's morning traffic on Tuesday, June 24, 1969. The Marine Corps helicopter lifted off the White House lawn with the President on board along with Secretary Volpe, Federal Highway Administrator Francis C. "Frank" Turner, Deputy Mayor Thomas Fletcher, City Council Chairman Gilbert Hahn, Jr., and District Highway Director Thomas F. Airis. Two presidential aides were in the rear of the craft with the newsmen: Nixon urban aide Daniel Patrick Moynihan and John D. Ehrlichman, counsel to the President. Turner was the chief guide. He noted such phenomena as the almost evenly balanced rush-hour flow of traffic into and out of Washington, such facilities as the new interchange at Telegraph Road and Duke Street in Alexandria "opened just three months ago" and such current projects as the widening of Shirley Highway. The figures, studied by the President just before landing, showed bridge traffic of 182,400 vehicles per day in 1950 had grown to 465,500 by last February. One of the sites on yesterday's tour, viewed twice, was Three Sisters Islands, the small rock outcroppings in the Potomac River near Georgetown where the road builders want to erect a bridge. It has become the chief symbol of the seemingly endless dispute . . . . The full itinerary included views of some routes whose twice-daily patterns of congestion became familiar to Mr. Nixon during his 15 earlier Washington years as a Government lawyer, congressman, senator, and Vice President. "I used to drive out here," the President recalled as he peered down at the Seven Corners shopping center in Fairfax County, ringed in early morning by an empty expanse of asphalt parking lots. "There used to be nothing more than a country store." Looking at lines of traffic inching across the Theodore Roosevelt and 14th Street bridges, Mr. Nixon asked, "Where are they going to park the cars?" City Council Chairman Gilbert Hahn, Jr. shook his head in silent negative reply. Hahn has said publicly that he would like to curtail all-day parking in the city to induce more transit riding. Mr. Nixon already was aware of the light use of transit. Observing a jam of automobiles on U.S. Rte. 50 east of Glebe Road in Arlington, he remarked: "Sure not many buses."
. . . Traffic somehow looked from the air to be lighter than it seems to a motorist on the ground, but several jams were seen. Perhaps the most massive were mile-long backups at the South Capitol Street and 11th Street bridges across the Anacostia River. "Unless something is done to change the entire direction of planning in this city," Volpe told the President, "we're faced with some real, real problems." After the helicopter returned to the White House at about 8:35 a.m., the President summed up the trip. "I'm glad that we don't have to drive to work." 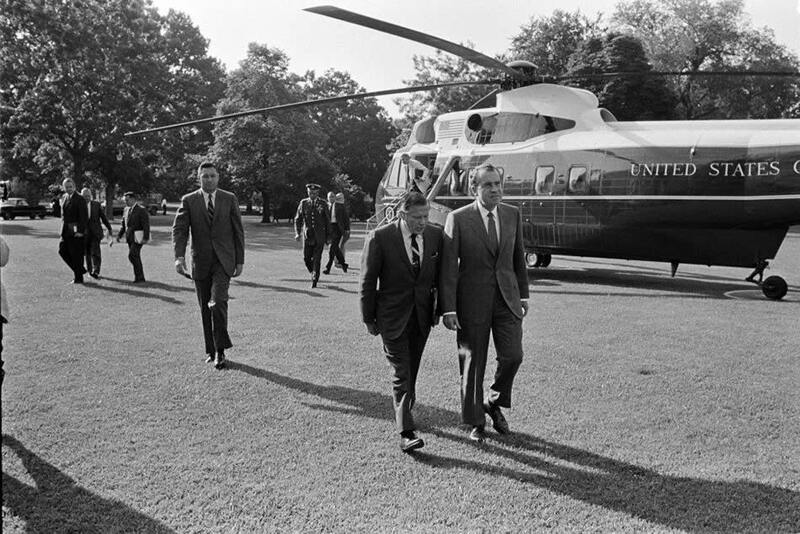 President Richard M. Nixon (in foreground) and Secretary of Transportation John A. Volpe discussed their morning view by helicopter of Washington area traffic. In the group of three men on the left, Federal Highway Administrator Francis C. “Frank” Turner is the trailing figure. Near the helicopter steps, the man behind the officer is John D. Ehrlichman, counsel to the President. (Photo: Richard Nixon Presidential Library and Museum). The tour did not include the northern part of the District. However, President Nixon had many opportunities to view highway operations, if he wished to, during his trips to Camp David, the presidential retreat in Maryland. Volpe told reporters that the President was "concerned that the subway funds have been held up for 1½ years," but the Secretary hoped "the differences will be worked out quickly." Referring to freeway opponents, he said, "They are conscientious but their objections don't take into consideration the facts of life," namely that traffic was going to increase whether the freeways were built or not. Following the helicopter tour, Secretary Volpe continued the bandwagon effect. On August 9, the City Council accepted reality. To get the subway funds, the council approved the freeways mandated by the 1968 Act, including the Three Sisters Bridge, but only after a near riot broke out among freeway opponents in the City Council chamber. Following meetings between President Nixon and Chairman Natcher, the President wrote to the Congressman on August 12. Now that the City Council had approved the freeway plan, the President assured the chairman that if opponents tried to stop construction by going to court, he would direct Attorney General John Mitchell and Secretary Volpe to work with the city's Corporation Counsel "to vigorously defend any lawsuits which may be filed." On September 24, Chairman Natcher agreed to release the District matching funds in the pending District appropriations act. President Nixon released a statement congratulating everyone for making the start of Metro construction possible. "More than a subway will begin in December. A city will begin to renew itself, a metropolitan area to pull itself together." With the help of President Nixon's helicopter flight, Secretary Volpe had broken the impasse. On December 9, 1969, Secretary Volpe joined officials at Judiciary Square. After the speeches, they broke ground to begin Metro construction. City officials quickly reverted to their freeway opposition, and Chairman Natcher went back to blocking the city's matching funds for Metro. The House of Representatives finally overruled him in December 1971 and agreed to appropriate the funds. Chairman Natcher understood that from then on, he would not be able to hold the matching funds "hostage" or for "blackmail," the terms used by Metro supporters and freeway critics, to force freeway construction. As for the bridge, the courts would block construction, with the Supreme Court rejecting the city's final appeal. Much of the freeway network that was not underway in 1969 would eventually be withdrawn from the Interstate System under the Interstate withdrawal-substitution program initiated by the Federal-Aid Highway Act of 1973. Much of the substitute funding would be used for Metro construction. With numerous bumps along the way, Metro's initial 103-mile, 83-station network was completed on January 13, 2001, with the opening of the Green Line between the Anacostia and Branch Avenue stations. 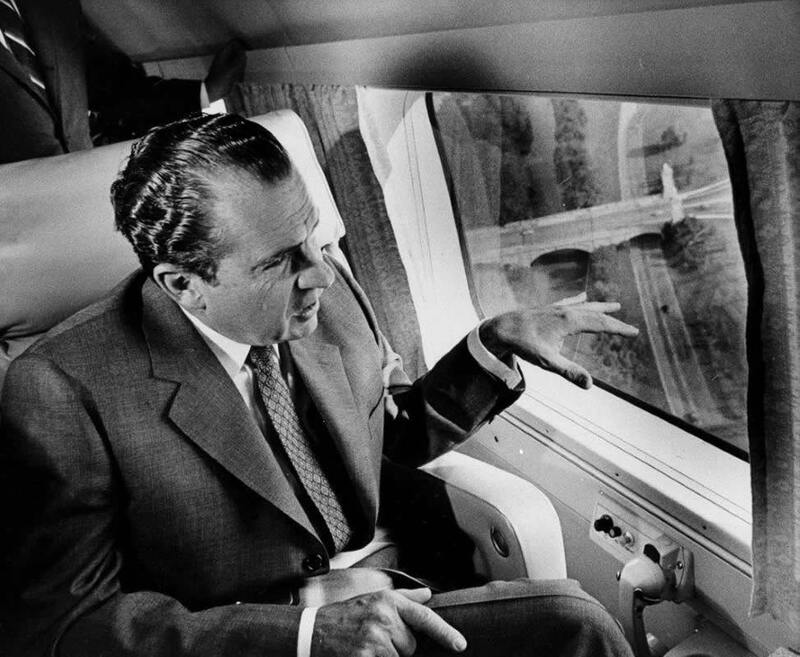 That moment in time, when President Nixon took to the air to view traffic congestion on June 24, 1969, launched the bandwagon that led to the start of Metro construction.